Salt and Pepper are two crucial ingredients in preparing a tasty dish. Both are unique flavours plus there are many different kinds of salt and pepper out there and each variation vastly changes the taste of your dish. So with this in mind, we want to add some different kinds of "salt" and "pepper" to practice and theory in Performance Art. What different kinds of Performance Art practice and theory can we apply and how can these elements shape a performance holistically? We will explore these possibilities and present them in the final public performance. In the first part of the course, we will offer a variety of exercises, tasks and assignments on Performance Art practice. Students will gain knowledge in dealing with the different aspects of Performance Art and how elements such as body, space, time and materiality can be utilised. In doing so, the participants are encouraged to find their own personal approach to Performance Art. The second part of the course will be based on theory in which the participants will apply theoretical knowledge in reflecting upon their own practice. This will be done through lectures, discussions and critiques which aim to broaden participants knowledge and understanding of Performance Art. Article in Berlin Art Links by Alison Hugill about the PAO festival 2015, mentioning the final presentation of PAS #42. 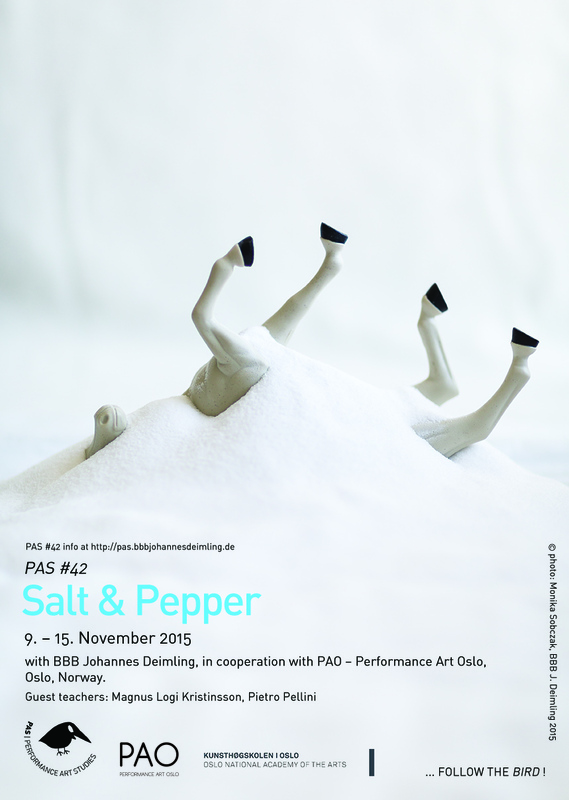 Article by Av Lisa Stålspets about the PAO festival 2015, mentioning the final presentation of PAS #42.